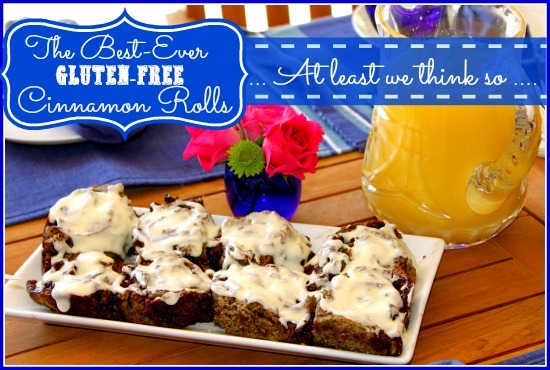 Gluten-Free Cinnamon Roll Recipe – The Hands Down Winner! This Gluten-Free Cinnamon Roll Recipe was begging to be made. Because we had our first official cold snap that lasted longer than 3 days last weekend. And isn’t that just as good a reason as any? We are seriously wimps here in Scottsdale, AZ. And while it was in the low 20’s for quite a few days, I do have to remind myself to quit complaining when I think about the rest of you who are enduring below zero temps. But like I said…we admit it. We. Are. Wimps. And apparently so are my tomato and pepper plants. While I tucked all of my veggies in the garden in like little babies to try and protect them, those beautiful peppers and all of my tomatoes took a beating and just could not hang with those below freezing temps. Boo. Anyway, to pass the time while I was mourning their loss, I decided to do some baking and indulge the boys. Because, after all, if we can’t eat our veggies we might as well eat cinnamon rolls. That must be a saying somewhere. Right? Plus, like I mentioned before…these babies were begging to be made. And because I made my Gluten-Free Kringle Recipe this year for Christmas morning instead of my usual Best Ever Gluten-Free Cinnamon Rolls (okay, perhaps I am slightly biased), I thought it would be fun to whip up a batch of those sweet rolls. And just for the record, it shocks me every time how quickly a treat like this can disappear from my boy’s plates. 1. Dissolve the yeast in the warm milk in a large bowl of mixer and let sit for 5-10 minutes (checking for bubbles/foam for active yeast). Then add the sugar, butter, oil, and vanilla to this yeast mixture, stirring to combine. Then add egg (or substitute) and whisk again to combine. 2. In medium bowl, sift/whisk together potato starch, arrowroot starch, millet, baking soda, guar gum, baking powder, and salt. Then slowly add flour mixture to active yeast/milk mixture in the mixing bowl and mix slowly to combine. Dough will seem sticky (this is right). 4. After dough has been allowed to rise, place a piece of plastic wrap (about 14×14 inches) on counter sprinkled with sugar and a little oil and then place dough on top, then another equal sized piece of plastic wrap on top and roll out dough until about 1/4 in thick. Remove top piece of plastic, then spread softened butter (or coconut oil) on top of dough. Combine brown sugar, cinnamon, and raisins and sprinkle evenly over butter/oil, leaving a 2 in. edge free of the filling so it won’t squeeze out when rolling. 5. Using the bottom piece of plastic wrap, lift the dough and begin to rolling into a log, without squeezing too tightly. Once rolled, to slice it, take a 12 inch piece of dental floss and slide it under the roll. Bring ends up and and holding ends above roll, cross them over as if you are about to tie them. Pull tight and you will have a perfect cut. Repeat 7 more times to slice the log into 8 pieces. Dental floss cuts perfectly without squeezing out your filling. Place rolls into greased 9 inch round cake pan. 6. Okay, here is a trick. You can make these the night before up until the end of step 5. Then put them in the fridge covered with plastic wrap until the next morning. In morning, bring them to room temp for about 30 minutes and then cook in an oven preheated to 375 degrees for 22 minutes, until the tops are lightly browned. 7. While rolls are baking, mix together all icing ingredients with hand mixer until reach desired consistency. When rolls are ready, allow to cool for a few minutes, then drizzle with the icing. Enjoy. 😉 They are pretty drool-worthy, Laruel! You are going to make me a hero with the men in my family. Does it get better than cinnamon rolls? Oh, how fabulous these cinnamon rolls are, Kim! You are becoming the queen of gluten-free pastries, my dear! And be glad you are not here tonight. It’s just too chilly … the woodstove is working overtime! Wow, these look like the real thing. Gorgeous. No wonder you didn’t mourn your frozen veggies very long. I’ve never in my life made cinnamon rolls. I guess it’s time I did! PS Brussels sprouts or cinnamon rolls? I love Brussels, but seriously? Pass the cinnamon rolls, please. Sorry to hear about those veggies that froze. Gardening takes so much work and then cooperation from mother nature. Everyone here in SOCAL are wimps too. It got down to 45 and you would like it was 0 here too. I feel bad for those really in those low temps, even your 20. Not missing that. Diane, that is so true. People in SOCAL are wimps as well (even though I am not one to talk). We have been there when they were having a cold snap and we actually thought it was warm compared to our dry wimter temps. Just picked up the recipe. Gona try it right away. But, didn’t you know Cinnamon Rolls go very well in the tropics, toooo. Here in Georgia we eat ‘um 3 meals a day if we can.